NIDCO and Port Authority officials look on at the Galleon’s Passage as its docks at the Scarborough port last Saturday. Sinanan expressed this optimism today. The Galleons Passage made its second test run to Tobago last Saturday. The vessel made its first test run on September 1. Sinanan told Newsday that everything checks out with the Galleons Passage in terms of its mechanical performance. He also said the vessel’s initial challenges with berthing have been dealt with. 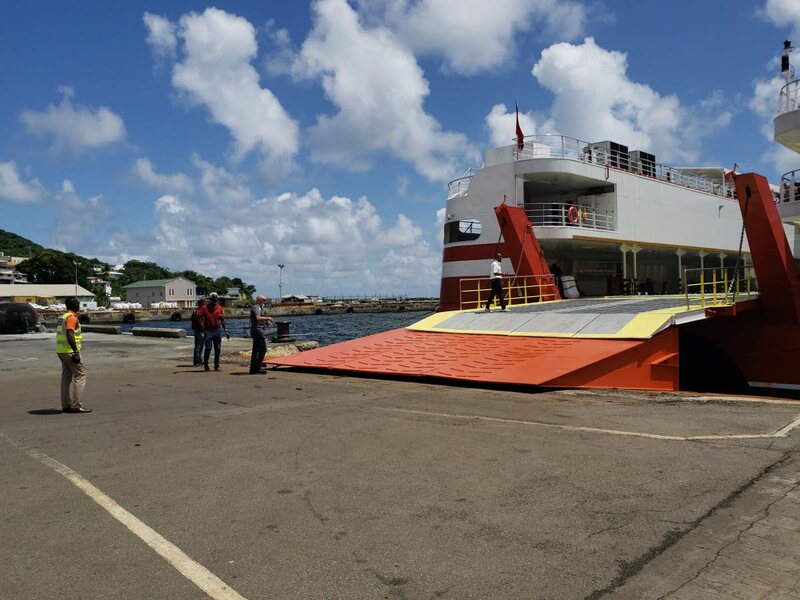 Last Saturday National Infrastructure Development Company (Nidco) chairman Herbert George said the ferry made a successful berthing using its stern ramp at the Scarborough port. The Galleons Passage had trouble berthing at the port on September 1 with its bow ramp but was able to do so with its stern ramp. Sinanan said the vessel is now in the final stages of certification and should be operating on the seabridge soon. On the fast ferry which Nidco is seeking to lease while two new fast ferries are built in Australia, Sinanan said he has not received feedback on any parties willing to lease such a vessel. Nidco is seeking to procure a high-speed passenger/vehicle catamaran to be engaged on a time charter for two years with an option for an additional year. The tender closes on October 26. Sinanan explained it was normal in this exercise for interested parties to withhold submission of tender documents until closer to the deadline. The specifications for this ferry include an 800-1,000 passenger capacity, 250-300 cars, length between 90 and100 metres and speed of 33-38 knots. The two new fast ferries are expected to arrive in TT in mid-2020. Reply to "Galleons Passage sailing soon"